Retaining walls can be built using a wide range of materials including concrete block, brick, natural stone, treated timber and more. With all retaining walls there are certain rules that apply in construction to keep the wall’s structural integrity and keep your wall looking great. It is very important that you have the right type of footing to stop your wall sinking or moving. Also that you install sufficient drainage outlets and material to relieve any excess pressure from behind your wall. Retaining Walls can be built using a number of materials and processes. Interlocking block retaining walls can be constructed either in a single level or over several tiers. An interlocking block retaining wall is safe to build from 200mm – 1000mm in height and requires no engineering. The blocks in the retaining wall sit on either a concrete or compacted road base footing depending on your specific site conditions and the desired wall height. The blocks that are used to form the retaining wall are then simply stacked on top of each other, staggered throughout each row. We then fill the core of the interlocking blocks with a fine aggregate to solidify the wall. A matching top cap is then added to complete the look of your new retaining wall. Treated pine retaining walls are a common site throughout many projects due to their versatility, weight of materials and price. Harbour Side Landscaping build many treated pine retaining walls and have always had great results with their outcome. There are a number of methods of construction of this type of retaining wall, including the Crib style of treated pine retaining wall and the post and rail style of retaining wall. The Crib style retaining wall is constructed using treated pine slabs. This type of wall has no footing and the logs are laid level horizontally into the ground and are on a vertical rake. Throughout the wall many logs are sent back into the fill behind which canter levers the wall, these logs are called ‘deadmen’. 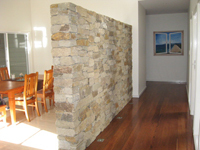 These walls are very strong and are used in a wide range of applications. They can be tiered and built up to a meter in each tier. The ‘post and rail’ style retaining wall uses treated pine sleepers. This style of retaining wall is constructed using posts concreted in to the ground which support the rails that are fastened behind. They can be built up to 1.5 meters in height although are commonly used in garden beds and planter boxes at lower heights. A tiered besser-block retaining wall adds style an class to your yard and can be finished in a number of ways to suit the rest of your property. Besser block retaining walls can be finished with a concrete render or have other integrated elements such as a slat fence or garden beds added to enhance this feature. The blocks sit on a concrete footing and are mortared together to form a solid foundation for the retaining wall. We also add reinforced steel throughout the retaining wall tied into the concrete footing. The blocks are then core filled with a concrete mix to set and complete the wall. These retaining walls are extremely strong, durable and can be built up to several meters in height. There are a number of ways that a natural stone retaining wall can be formed, utilising a number of materials. Harbour Side Landscaping have build natural stone retaining walls out of the following materials. Sawn sandstone block has worked well in many instances throughout the Sutherland Shire where a lot of the design requirements have been for a 'rock faced’ finish. These sandstone retaining walls always sit on a concrete footing and are mortared together in a similar fashion to the besser blocks. Unlike besser blocks however, these sandstone blocks are a solid piece which requires no reinforcement or filling. Depending on the height of the wall, a course of bricks may need to be tied in to provide the retaining wall with additional strength. Natural sandstone walls are suitable for heights up to 800mm and are ideal when used in garden applications or featured areas due to the eye-catching and beautiful natural characteristics that this kind of stone provides. Another popular natural stone finish utilises stone cladding to complete the retaining wall. This stone can be derived from a mixture of granites and can be used as a frontage to a besser block wall. These types of retaining walls are commonly used in entrance ways, pool areas and fire places. 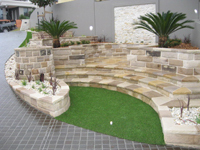 Harbour Side Landscaping have built a number of stone cladding retaining walls in the Sutherland Shire and Wollongong areas due to their versatility of use given they can be used both externally and internally as striking feature walls. CONTACT 0405 128 699 TODAY TO DISCUSS YOUR RETAINING WALL PROJECT. WE SERVICE CLIENTS THROUGHOUT THE SUTHERLAND SHIRE AND ILLAWARRA. Thank you for your submission. We'll be back in touch with you within 48 hours.